The thousands and thousands of miles of barbed wire fence chopping up lands throughout the west is bad for wildlife for many reasons. Now, the impact that this installation for livestock production on public lands has to sage grouse is demonstrated in a study showing definitively that many sage grouse die in collisions with barbed wire fences. This should inform the US Fish & Wildlife’s court-ordered decision about whether or not to list sage grouse. Coming across a big game carcass entangled in a barb wire fence is one of the more grusome sights in the natural world that I have experienced. It is amazing how much wildlife benefit from thoughtful fencing. Jeff–why not go for no fencing on public lands? I’ve ripped out lots of old livestock wire (both barbed and sheep fence) on projects in Hells Canyon, Hart Mtn and Steens Mtn. It’s very rewarding to see the landscape revert from a tamed pasture to a wild space again, and as this article shows, greatly benefits wildlife. Unfortunately, the agencies seem to regard fencing as their main tool in trying to stop livestock damage to springs, fish spawning streams, meadows, etc., so I have seen a lot of new, bad for wildlife fencing being installed on public lands in the past few years. New fencing is expensive for taxpayers too, running about $10K-15K per mile according to a recent FOIA response I received. Often, the fencing doesn’t last more than a season or two before it’s in disrepair and the cattle are destroying whatever was supposed to be protected. So this fencing mania is a big waste, in my opinion, from both a wildlife and economic perspective. I’m all for getting rid of the fences, just from a practical standpoint I’d like to see safer fencing. I agree with Mikepost above. However, I have seen Great Horned Owls and Redtailed Hawks killed by barbed wire. I have also seen carcasses of deer and elk stuck to fences or pulled away after dying. Barbed wire does its share of damage, too. Whatever happened to real cowboys that herd cattle around, riding horses? I disagree that cross-fencing is the only way to intelligently manage grazing. Permittees should have to control their stock, not pawn off this responsibility to agencies and taxpayers. I have seen deer fawns bashing themselves against a tight wire fence trying to get through. I read an IDFG account of a bighorn sheep that died trapped in barbed wire. 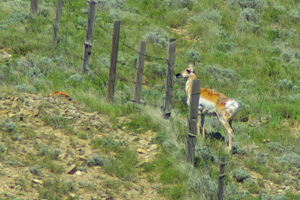 Birds and pronghorns are terribly impacted by barbed wire fencing. This stuff does great harm to wildlife, blocks recreational access, and shouldn’t be strung across thousands of miles of public land. The simple reason ground animals, flying birds, and even humans impact a fence line is because they didn’t SEE it, or when they did , it was too late to change direction and impacted it!! We are the manufacturer of a unique fence warning device that attaches, with finger tip manipulation, to any commonly used fence wire, electric or not, that includes BARBED WIRE. Visit our product line web site at http://WWW.FENCE-FLAG.COM and read a testimonal on how our FENCE-FLAG® is contributing to a safer and visible BARBED WIRE barrier at the ROCKY FLATS SITE in COLORADO, once a nuclear trigger facility, now a wildlife refuge. Visit our site and request a free sample.